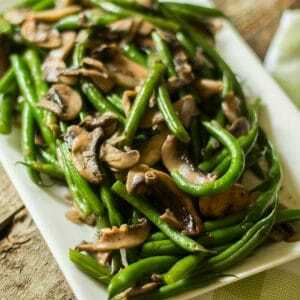 Green Beans and Mushrooms with Shallots, a delicious and healthy low carb side dish that’s ready in about 20 minutes! These healthy green beans are also a great make-ahead side dish too! Just warm them up when ready to eat! Great for Thanksgiving, Christmas any Holiday or family celebration! Easy enough for a healthy low-carb side dish for weeknight meals! 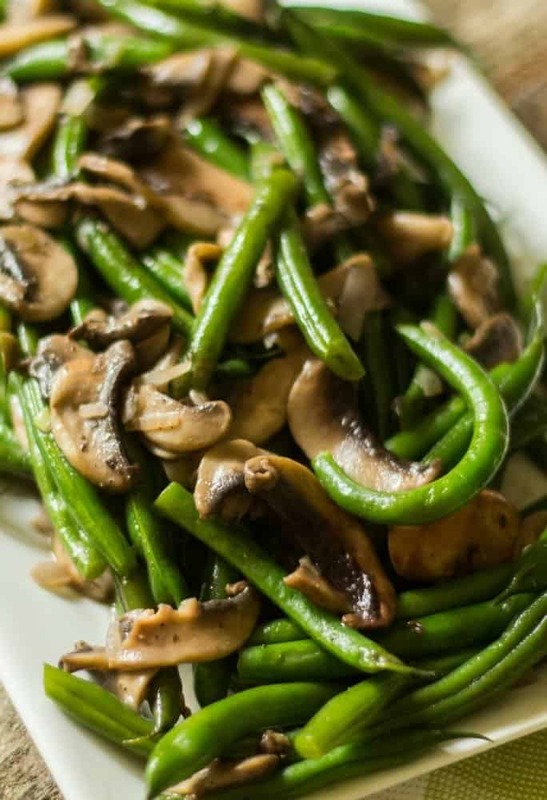 Green Beans and Mushrooms are low-carb, low-fat and ready in 20 minutes! Thanksgiving is one of my most favorite Holidays! Why? You ask? I am sure you are at the edge of your seats with curiosity! :) Thanksgiving is a wonderful day because it’s a family Holiday where sharing food and family time is most important. The anticipation of receiving and giving gifts is not pressuring us! I love cooking a great Turkey on Thanksgiving and a delicious healthy green bean recipe is a must make. These green beans and mushrooms are always a hit! The classic green bean casserole is great, but I really have to watch what I eat and enjoy a slice of something for dessert. So these green beans with mushrooms and shallots are a great way of slimming down the green bean casserole and keeping it really tasty and guess what, so easy and quick to prepare! The shallots caramelize and the mushrooms add the perfect amount of added flavor to make a healthy green bean recipe. Below are some questions I have been asked about this recipe. I hope these help you and please enjoy the recipe! How to store fresh green beans? I pick fresh green beans at the grocer or farmers market that are green, no brown spots and firm. I do not watch them until ready to use. I store them in a plastic bag in the fridge until ready to use. Then I wash the green beans and snip the ends. They can keep about 4 days in the fridge. Can frozen green beans be used in this recipe? I really prefer fresh green beans with this recipe. Frozen beans will produce a lot of excess water and the flavors will not be as fresh. I have used them in a pinch but again, fresh beans my first choice. What about using canned beans in this recipe? I have never used canned green beans so I cannot give advice on using them with any recipe. I do not use canned green beans because of the added sodium and preservatives. Are Green Beans and String Beans the same thing? Yes. Green beans and string beans are the same vegetables. This recipe calls for blanching the green beans. Blanching is a fancy term for cooking a vegetable till just cooked through. Bring a pot of water to boil, season with salt. Drop the fresh green beans into the boiling water and let cook about 3-5 minutes, depending on the size of the beans. When beans are cooked, drain in a colander. Immediately drop into ice water. This will ensure the beans stop cooking and maintain their green color. Blanch the green beans in boiling salted water, for about 4 minutes. Strain the beans and quickly placing beans in ice water to maintain their bright green color. Set aside. In a saute pan, add the unsalted butter to melt, add the mushrooms and shallots. Stir for 3 minutes. Add back in the green beans to make a healthy green bean recipe. These green beans can be made ahead and reheated when ready to serve. My family loves these green beans and they can be prepared the day before Thanksgiving or whenever you are going to be eating them. They are an easy make-ahead side dish! I hope you give these a go for this Thanksgiving! They are absolutely yummy! 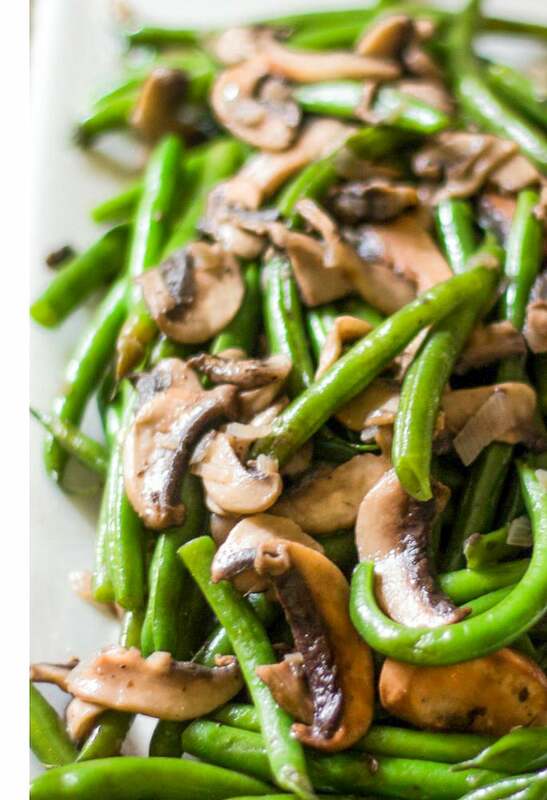 I hope you add these Green Beans and Mushrooms to your favorite PINTEREST BOARDS! I’d love for you to follow me on PINTEREST! I’m always pinning from talented and amazing bloggers! This recipe was originally published Nov 2015. The post, Video, and photos have been updated! Also, vegan string bean option has been updated. 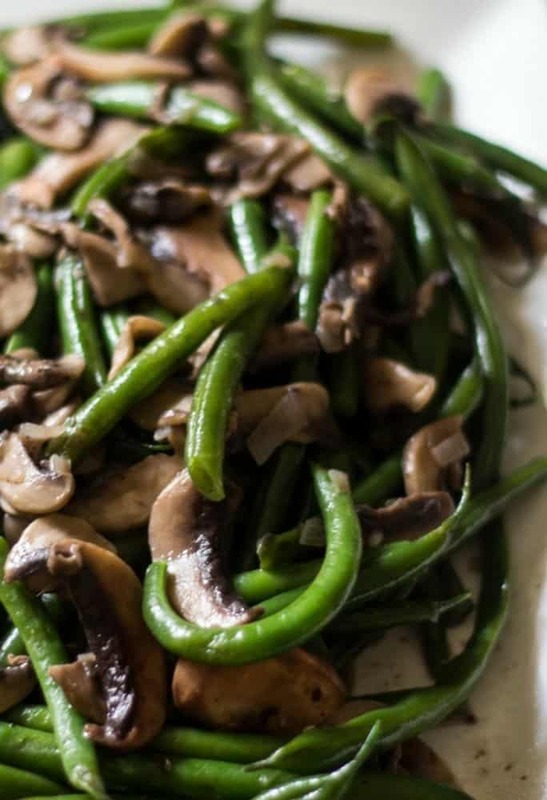 Enjoy these Green Beans and Mushrooms with Shallots! Love these easy green bean side dish, giving it a 5-star rating is super helpful for me and very much appreciated! Tender, blanched string beans with sauteed sliced mushrooms and shallots, Low-fat,low-calorie, low-carb. Great side dish that can be prepared ahead of time and reheated when ready to serve! Perfect for a Holiday side dish! Blanch string beans in large saute pan of boiling salted water for about 4 minutes. Strain string beans and place them in ice water to maintain the bright green color. In same saute pan, over medium heat, melt the butter and saute the shallots for about 2 minutes, until translucent. Add in the mushrooms and cook for another 2 to 3 minutes. Add in the string beans to heat through. Season with salt and pepper to taste. Serve immediately or refrigerate, covered and reheat the next day. Feel free to swap butter flavored coconut oil or vegan butter in lieu of unsalted butter to keep this Vegan. That is fabulous news Barbara! I am so glad you enjoyed and have a very Blessed Easter and enjoy the green beans! I made this dish this past weekend. Simply delicious! We all loved it and can’t wait to have it again! Keep the recipes coming! They are delicious and healthy! What a perfect dish for Thanksgiving! I love Green Beans and mushrooms together! But I do love how this recipe is easy-to-prepare, plus it’s healthy too! Well definitely don’t eat the beans, we want you healthy! but thank you for the kind words! This looks delicious! We are big green bean fans around here, so I’ll have to give this a shot at Thanksgiving. I hope you enjoy – this is qick and easy! This looks tasty! We got plenty of green beans here in the Philippines and I think I can prepare one of this. Thanks for the recipe! I LOVE, LOVE, LOVE Green beans. This looks like something I need to make. I will even green beans as a snack! My daughter ate the entire bowl after I photographed them! These green beans look so delicious. I have only ever ate them alone and plain. I am sure yours are much more tasty! Yum! These sound great . I’m trying to keep eating healthy, so I like this option as opposed to the traditional casserole. Omg!! !this sounds so delicious!!! Definitely going to have to give this a try! Looks amazing! So glad we have an alternative to the traditional green bean casserole recipe with canned soup and other salty, chemical-laden ingredients. Thank you! I’m in charge of the green beans this year! I absolutely love grean beans! They’re my favorite vegetable, and I think this mushroom and shallots idea is my new-favorite way to prepare them. This dish looks absolutely delish! I am so glad you like the recipe, enjoy! Something about green beans screams Thanksgiving! The photos are great, and the beans look delicious. Good timing, because I’m assigned a vegetable side dish! My family would eat any kind of vegetable except green beans. I am the only one who loves them. They taste great blanched and stir fried in butter and vegetarian oyster sauce. I will try your recipe too. My family can have all the mushrooms. The green beans are mine. I love green beans, it’s one of my favorite veggies! It’s always perfect with savory dishes. Green beans are my favorite veggies, and I love how easy this looks to make! Thank you Denise! These are so easy and yummy! Got to love a good green bean recipe they are so good for you and great for your digestive system! Thank you Ana, these are so good and easy to make! I am not a fan of green beans, but this looks so good. I think this is worth giving a try. I bet green beans are one of my very favorite vegetables. The mushrooms would make them even more tasty. i love green beans with mushroom and oyster sauce, i usually make them for my children, yours look really yummy too. Oh Eileen, this looks and sounds absolutely delicious – I really love mushrooms 🙂 Yummy! I thank you Claire! You are such an amazing cook, I thank you for the kind compliment! Great recipe! I am going to have to add this to my menu! Thanks so much! Green beans are my favorite vegetables. This is such a flavorful and delicious way to prepare them. Thank you Angie, I hope you enjoy! Yum! I love green beans & I could eat them everyday. These look tasty, thanks for sharing.